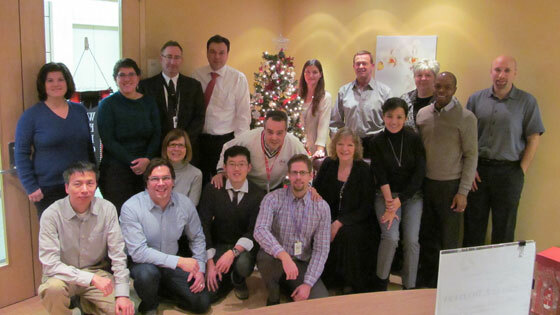 The Infrastructure “Elves” that contributed to this wonderful cause: (Back Row from left to right) Lisa Vanlint, Kady Cowan, Rick Pews, Douglas Weaver, Tina Agostinis, Michael Sheeres, Janet Hall, Franz Thompson, Ed Rubinstein. (Front Row from left to right) Songyang Hu, Mark Reynolds, Debbie Dravis-Henning, David Chan, Robert Pedretti, Michael Kurz, Nancy White, Veronica Rodriguez. (Photo: Carolyn Allison).